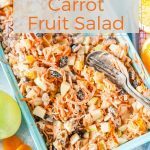 Creamy Carrot Fruit Salad is a delicious and healthy dessert or breakfast. 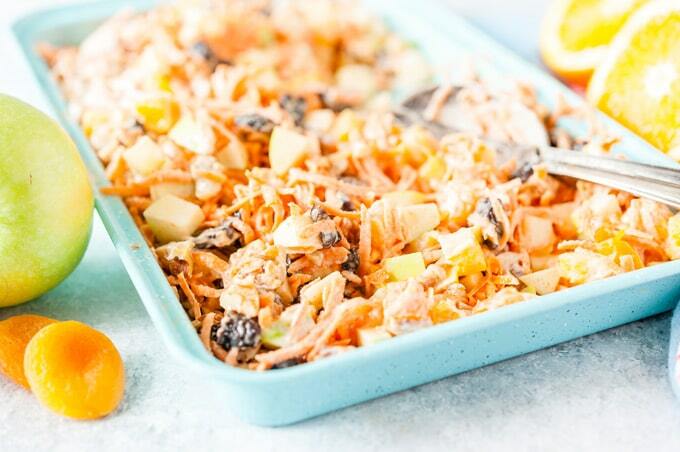 Made with lots of carrots and fruits, it’s beautiful and perfect to celebrate Easter. I was trying to come up with a new carrot recipe for Easter when I suddenly remembered a childhood favourite. 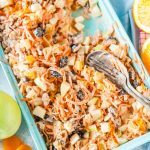 This Creamy Carrot Fruit Salad was always (and I mean always) on the table during any celebration or gathering. I tried to figure out the recipe and then I remembered that I actually wrote it down and even posted it on my very old Russian blog. 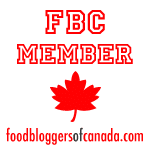 The blog is still there. With photos. Terrible photos. 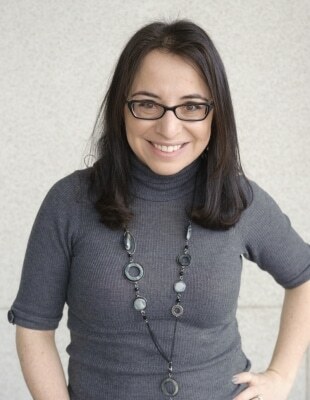 That blog post (very old blog post) and photos made me chuckle and made me sad. I talked about visiting my grandparents and eating that salad. Both of my grandparents passed away since then. 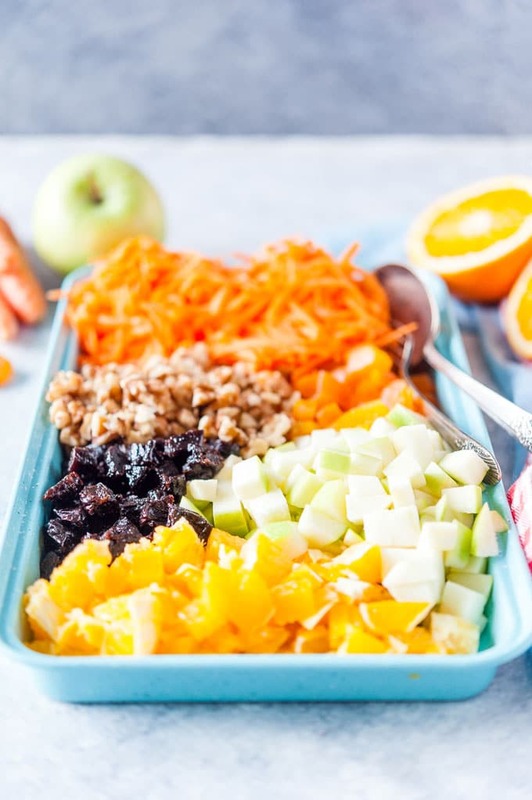 So, this incredible and delicious and super easy and beautiful Creamy Carrot Fruit Salad is in their honour and memory. 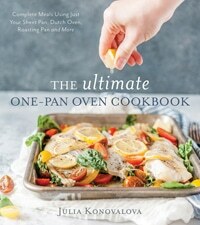 The ingredients are pretty common for someone Russian but could be a bit unusual for my North American Readers. In Russia we eat (or used to it as I am not sure what they eat now) a lot of dried fruits. It makes sense since there were no fruits readily available in the winters and fruit needed to be preserved. So, dried apricots and prunes are very common ingredients that are used in cakes, breads, salads, drinks, and savoury dishes. 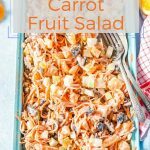 Making this Carrot Salad is super easy but it takes time and patience as all the ingredients need to be chopped. I like chopping everything in the same size pieces, this way the texture is uniform and you get a little bit of everything in each bite. Step 1: Make the creamy dressing by combining the sour cream, maple syrup, lemon juice, and cinnamon. Step 2: Prepare all the ingredients. Shred the carrots. Finely chop the walnuts. Dice all the other fruit into small pieces about the size of raisins. Step 3: Mix everything together with the dressing. 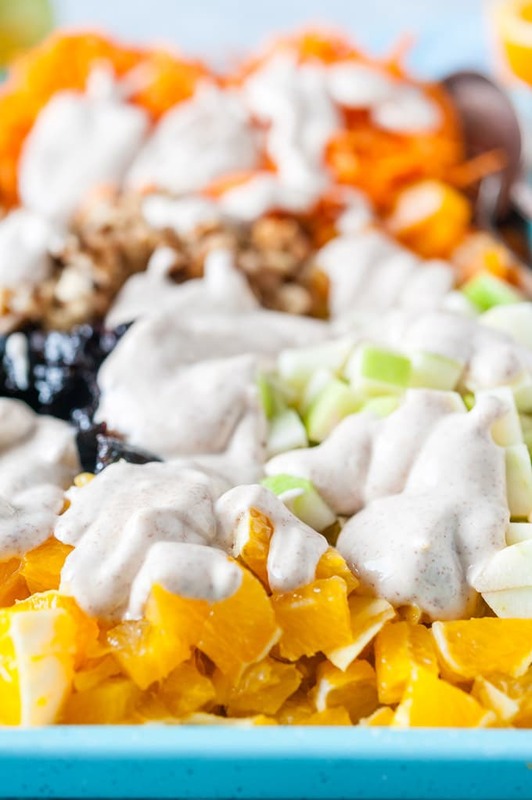 Let me start by providing the biggest and most unique variation for this Creamy Carrot Fruit Salad: the dressing. 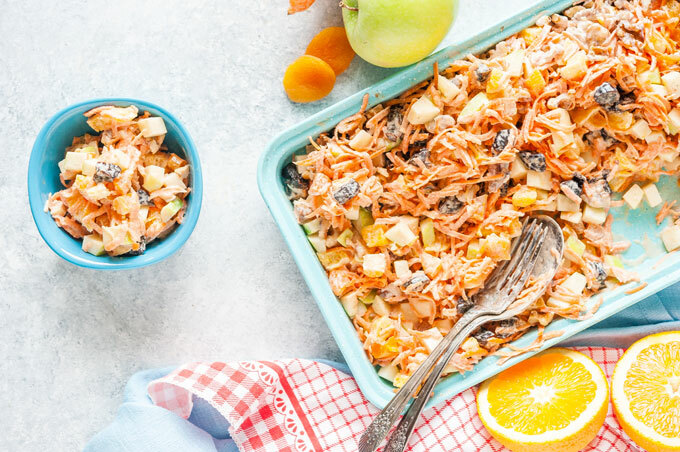 In my family, we always made a huge batch of all the ingredients and then used two different dressings to make two incredibly delicious and very different salads. The other version of the dressing was…. drum roll… mayonnaise with minced garlic. Strange? Yes. Delicious? You bet! 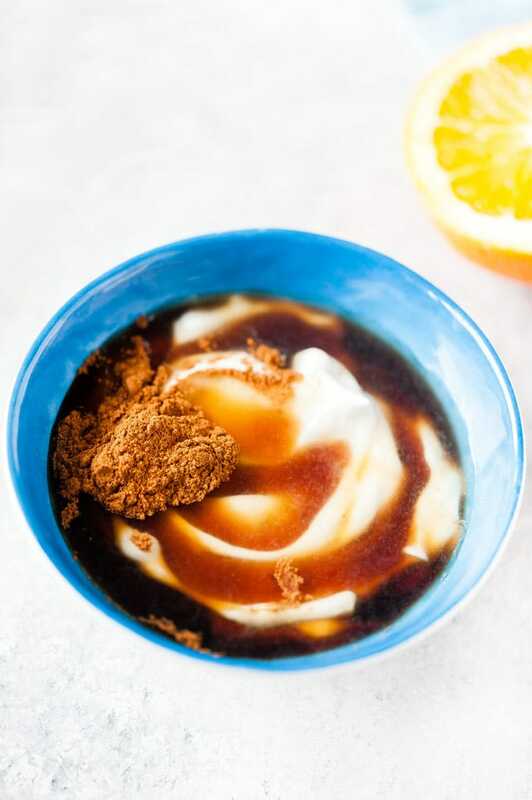 If you love combination of sweet and savoury together then you must try this version also: use mayo instead of sour cream, add 1-2 minced garlic cloves, and a big pinch of salt. It’s a very unusual, delicious, and piquant salad. It will be perfect as a side for chicken or meat. 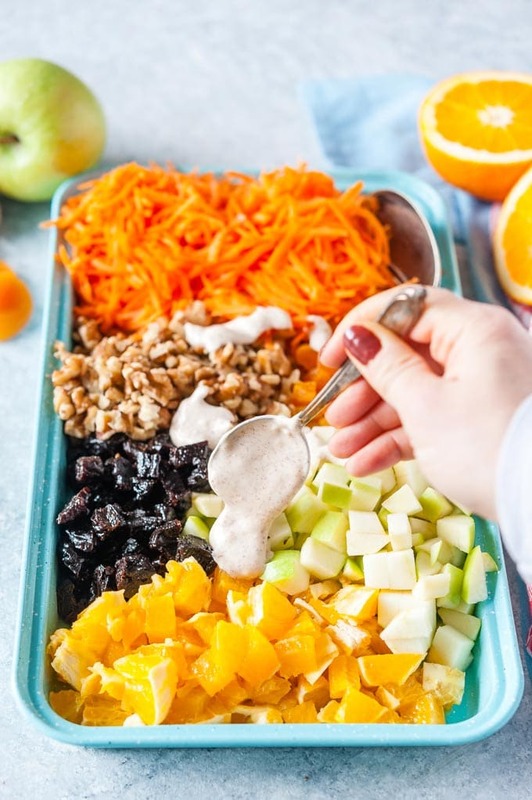 Technically you could use yogurt here if you are trying to eat a bit healthier but sour cream works just so much better in this Creamy Carrot Fruit Salad. Using yogurt would mean that the salad doesn’t store as well as with sour cream. I like a hint of cinnamon with the fruits, so I find it very enticing. My mom prefers this salad without cinnamon. Lemon juice is also optional but it just adds freshness and vibrance to the salad. Growing up we obviously didn’t have maple syrup in Soviet Union. You can use honey, sugar, or other sweetener of your choice. 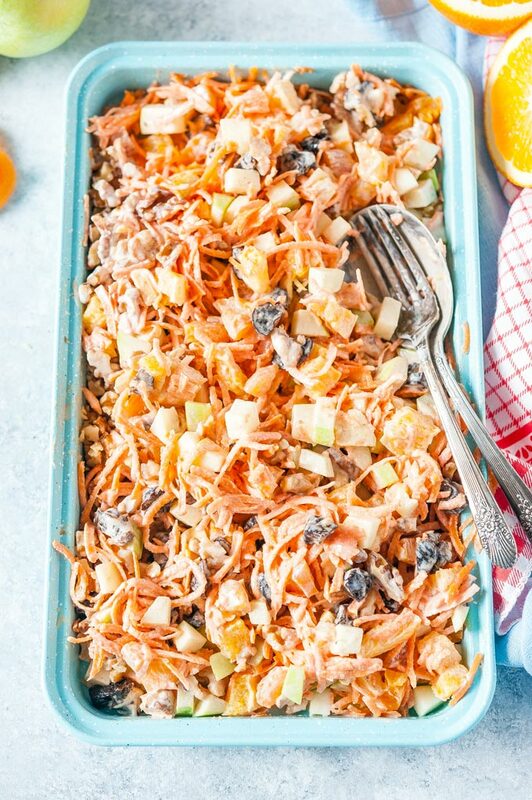 You can increase the amount if you prefer to serve this salad as dessert. Or you can decrease the amount for a healthier treat. Versions from my childhood always had raisins but I prefer mine without them. If you like raisins, add about 1/8-1/4 cup. 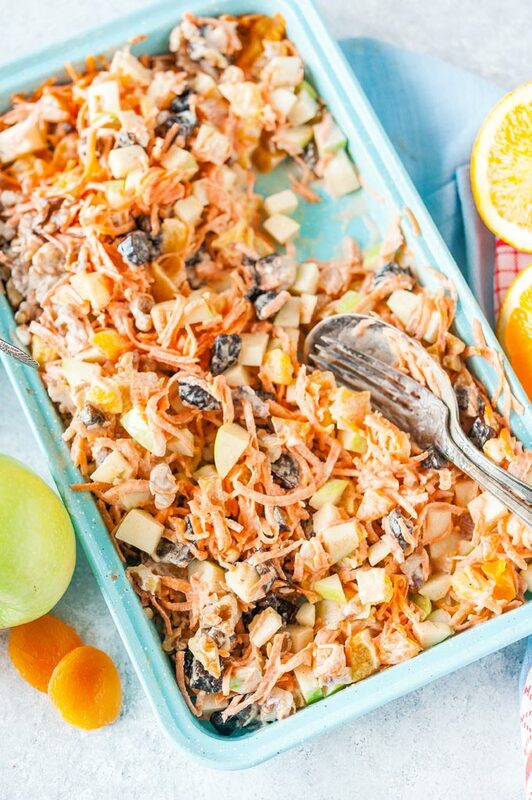 You really need to use Granny Smith in this Creamy Carrot Salad recipe. They are tangy and sour and provide a perfect counterbalance to sweet dried fruit. If you can’t find Granny Smith then try to find apples that aren’t too sweet. I use navel oranges but you could use any of your favourite kinds. These are the main ingredients that provide the sweetness, that’s why not a lot of maple syrup is needed. Prunes have a bad reputation but they are absolutely delicious and have a very complex flavour. I am a big fan of pecans but in this salad walnuts work better as they provide a slightly bitter taste which works great with the rest of the ingredients. If you don’t have walnuts or prefer not to use them then pecans will also work. You want shredded carrots, not grated. Basically, they should have enough texture and shouldn’t be grated into a pulp. Sometimes I shred them by hand but I prefer to use a food processor when I can. 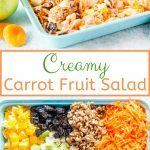 If you use sour cream as the recipe states, then this salad will store really well in an airtight container in the fridge for up to 5 days. 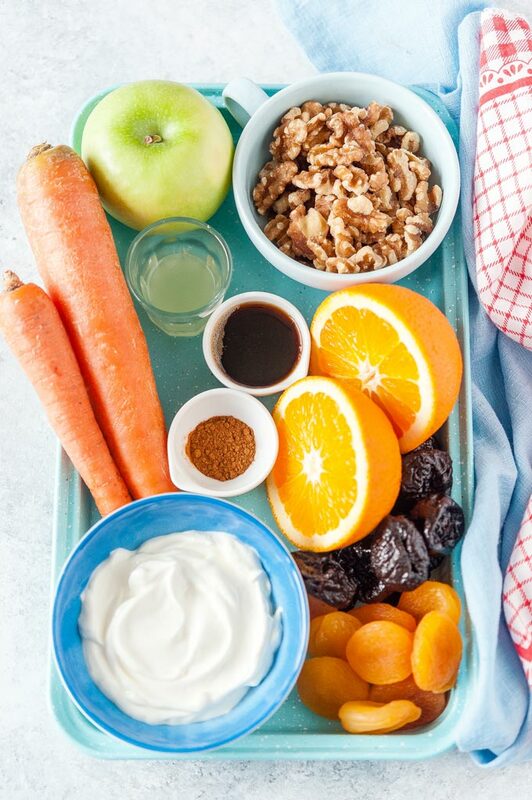 If you use yogurt, however, depending on the kind you use, the dressing may split a bit after a day or two and you’ll end up with clear liquid (whey) at the bottom of the container. You might also need to add more yogurt to get the salad to be creamy again. In a small bowl, combine together all the ingredients for the dressing and mix until smooth. Chop all the ingredients except for the shredded dressing into even small pieces about the size of a raisin. Put all the ingredients in a large bowl, add the dressing and mix until well combined. Optionally, add 1/8-1/4 cup raisins. 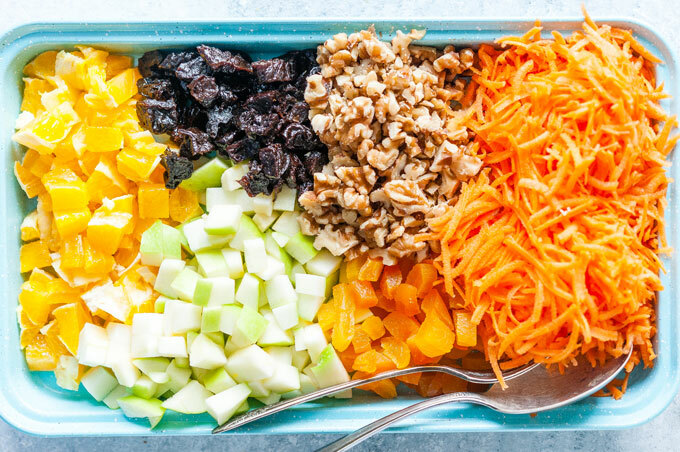 Most of the time I do not make dressing separately, I just add all the ingredients for the dressing into the bowl with the chopped fruit and mix well.